Washington, DC.- Five prominent Orthodox Christian community leaders, Charles R. Ajalat, Andrew A. Athens, Dr. George J. Farha, George M. Marcus, and John G. Rangos, Sr. were the recipients of IOCC’s (International Orthodox Christian Charities) Compassion at Work Award: The award was bestowed to these five visionary men for their extraordinary philanthropic contributions to the organization’s mission and its continued success over the past 20 years. 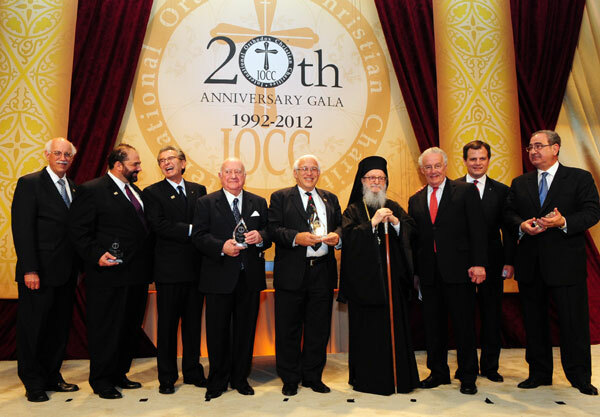 The honorees were recognized at the IOCC 20th Anniversary Gala, last Tuesday, in Washington, DC. Mike Emanuel, Chief Congressional Correspondent for FOX News Channel, serves as emcee for the gala, and Chris Hillman, Rock and Roll Hall of Famer and founding member of the Byrds, performed during the gala dinner. Three of the five award recipients, John G. Rangos, Sr., Andrew A. Athens and Charles R. Ajalat, founded the organization in 1992 and all five men, including George M. Marcus and Dr. George J. Farha, have served on the IOCC Board of Directors and are honorary IOCC board members. The gala festivities began with an afternoon congressional reception at the U.S. Capitol building, followed by a VIP cocktail reception and banquet dinner at the Capital Hilton Hotel. His Eminence Archbishop Demetrios of the Greek Orthodox Archdiocese of America praises benefactors Nicholas and Jeanne Tsakalos for their endowment of $100,000 to support IOCC programs dedicated to combating hunger through agriculture development and food security. 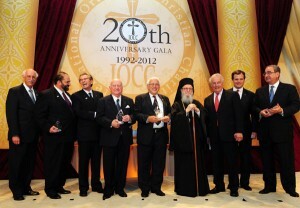 The gift was presented at IOCC’s 20th anniversary Gala held in Washington DC on May 8, 2012. His Eminence Archbishop Demetrios of the Greek Orthodox Archdiocese of America announced the establishment of the Harry and Liberty Tsakalos Endowment for Agriculture Development and Food Security by Mr. and Mrs. Nicholas Tsakalos of Phoenix, Maryland before 350 prominent Orthodox community leaders and guests at a gala celebration held in Washington DC on May 8, 2012 to mark 20 years of humanitarian service by International Orthodox Christian Charities (IOCC). The generous gift of $100,000 to the newly established fund will advance programs targeting emergency food assistance such as food distribution to people affected by natural disasters and emergencies, agricultural support and training for farmers, and other initiatives that provide effective and lasting solutions to hunger and life-saving nourishment to vulnerable families around the world. The gift was made in honor of the legacy of the Tsakalos family and the success of their H&S Bakery, the largest privately owned bakery in the United States. Harry Tsakalos was one of the original two founders of H&S Bakery together with his father-in-law, Isadore “Steve” Paterakis. The family-owned and operated bakery began in 1943 with Harry and Steve making Italian bread by hand out of their Baltimore row house. Today the bakery and its affiliates employ more than 2,000 people in seven states and distribute baked products in 23 states. As Greece faces its most severe economic crisis in decades, struggling Greek families are seeking medical assistance more than ever, with the greatest demand coming from elderly retirees whose pensions have been dramatically reduced by the Greek government’s austerity measures. International Orthodox Christian Charities (IOCC) in cooperation with Apostoli, the social service agency of the Greek Orthodox Archdiocese of Athens, and Doctors of the World-Greece, is responding to the overwhelming need for medical assistance with financial support and medical supplies destined for free clinics in some of the poorest neighborhoods in greater Athens. A shipment of more than $250,000 in medical supplies and equipment such as walkers, crutches, bandages and syringes is on its way to Greece thanks to the generous support of an emergency grant from the National Philoptochos Society. Supplies will be distributed to clinics operated by Apostoli in Athens and by Doctors of the World-Greece in the center of Athens, in Perama, a port city in the suburbs of Piraeus, Thessaloniki and Chania-Crete. The city of Perama is considered one of the poorest areas in the metropolis, with almost half of its residents, mostly shipyard workers, unemployed and without any health benefits for themselves or their families. IOCC is providing additional emergency support for a clinic in Perama. The clinic, which is open seven days a week and staffed by 30 volunteer doctors, nurses, psychologists and social workers, provides a variety of medical services to financially strapped families with nowhere else to go for their healthcare. 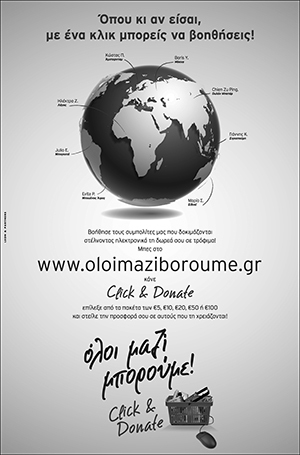 You can help the victims of poverty and conflicts around the world, like those in Greece, by making a financial gift to the Greece Response Fund, which will provide immediate relief as well as long-term support through the provision of emergency aid, recovery assistance and other support to help those in need. To make a gift, please visit www.iocc.org, call toll free at 1-877-803-IOCC (4622), or mail a check or money order payable to IOCC, P.O. Box 17398, Baltimore, MD 21297.